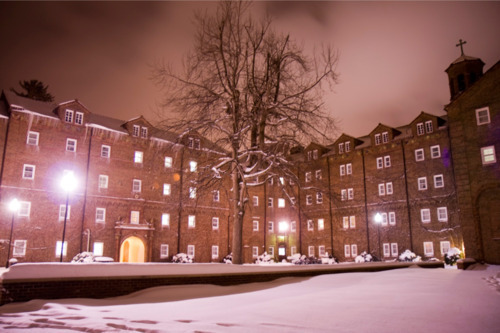 ST. BONAVENTURE (Feb. 16) – Following two consecutive weekends of prank fire drills in Devereux Hall, St. Bonaventure University students were unprepared for a real and intentional fire Sunday morning. At roughly 6:11, unidentified individuals rigged two microwaves to catch fire, triggering Bonaventure emergency procedures to kick in. “Everything worked just the way it should have,” Ralph Aloia, university fire/life Safety-NYS security instructor, said. He said smoke detectors sensed smoke within 180 seconds and 90 seconds later, signaled the fire. Safety and Security Services called fire authorities, and they arrived 14 minutes later. Within two minutes of their arrival, resident assistant staff safely evacuated most students from the dormitory. Smith eventually walked to the designated evacuation area in the Shay Hall lobby, but many students, including her, ignored the initial alarms. Eventually, a phone call from her friend woke Smith up, but when she was finally safe, she did not truly feel it. Despite the damage to student confidence, Vito Czyz, director of Safety and Security Services, said a host of groups are working towards swift justice. Czyz said Safety and Security Services, the Cattaraugus County Sheriff’s Department and the New York State Office for Fire Prevention and Control are processing evidence, both physical and circumstantial. Perpetrators, which Czyz believes to be a small group of people, would face any applicable charges, including criminal offense, felony offense and expulsion from the university. Junior sociology major Tiffany Nunez said the situation made her want to escape to home for a weekend. Although Czyz said he thought protocol was executed well, he did say campus safety features already planned, like more cameras around campus, will be completed this year. Aloia said it is better to look at the positive and find things to improve. Czyz said the university will never stop working to make the university safer, but he needs student help. Although the investigation is still under way, Czyz said the university is communicating with authorities daily to wrap up the hunt. Posted on February 16, 2012 by intrepidsbuPosted in UncategorizedTagged Devereux Hall Fire, Mark Belcher, news, Ralph Aloia, Vito Czyz, xs.